The history of art is a school subject taught to varying degrees in the National Education. Its purpose is to teach artistic works that have been realized in the past from a symbolic point of view. She strives to highlight artists, their lives, their opinions and how they emerge through their works. It also explains the impact of a work on the public in a cultural, demographic or religious context. The Eiffel Tower is a work of art in the field of architecture, it is usually in the curriculum of most courses. The rest of this page provides explanations on its construction, its origins and the public's view of it. But before going further, we must distinguish the curriculum because the National Education does not expect the same knowledge from the students depending on levels. Click on your level. Note that the difference between the primary, secondary and university level in art history does not lie in the format to be used to answer the questions but in the depth of the answer. This means that the learning mechanism is the same, regardless of the level of the student. So in primary school you have to answer in the same way as for higher level courses, but of course by lightening the answers. For secondary and university level, it will be necessary to adapt the answer according to the actual level of the students. Thus for fifth graders, who have just graduated from this cycle, the answers will be more in the "primary" part, but with supplements while the academics will have to complete their homework by information taken elsewhere in the site. When we say "primary level", we should rather say "cycle 3", from CM1 to 6th. It is at this age that students are most likely to do this kind of work when they are young. What is expected from the history of art is an analysis of the forms, techniques, meanings and uses of the work studied. Regarding the Eiffel Tower a primary school student can answer factual questions, this is usually done in class, but if he has to produce a text himself on the monument, he will have to rely on these 4 work items. But first of all you have to start with some simple information to locate the monument. 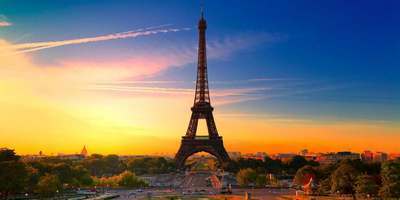 The Eiffel Tower is an iron tower that was built in the center of Paris, facing the Palais de Chaillot, on the Champs de Mars. 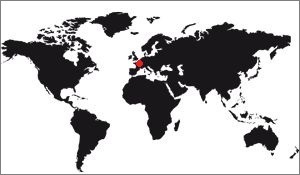 She is in the 7th arrondissement of Paris. It is made of beams and metal beams that intermingle. The builder of the tower called Gustave Eiffel, he called it "the tower of 300m". It was designed by Maurice Koechlin, his head of study department, and Emile Nouguier, the head of the methods department. 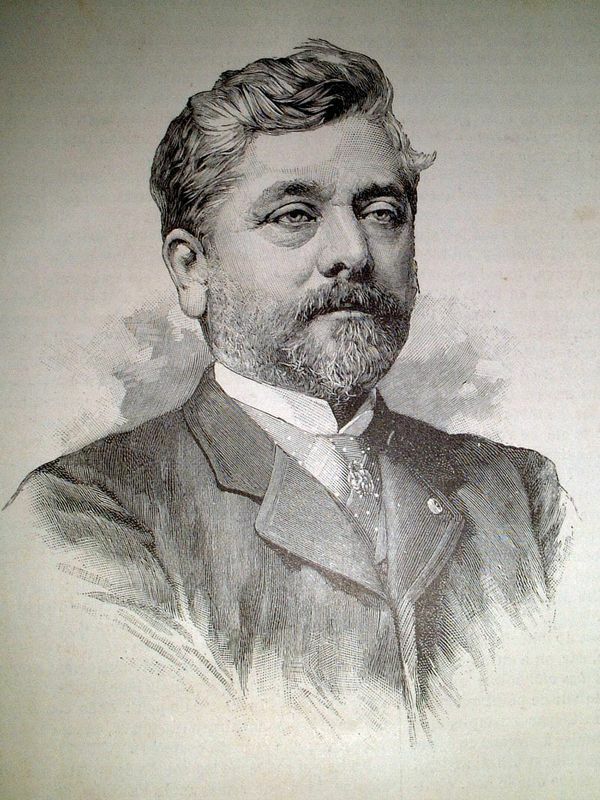 Gustave Eiffel was a late 20th century entrepreneur who specialized in building bridges. Its most impressive bridge is the Garabit viaduct, which is in Cantal, but it has made many others. The Eiffel Tower was the tallest building in the world at its construction. It was only overtaken in 1936 after the construction of the Empire State Building in New York. Puis, il faut faire une analyse des formes, qui peut être exprimée ainsi. The Eiffel Tower is an iron building, it is a set of interlocking beams that has the shape of a pyramid with curved sides. The base is made of 4 pillars containing stairs and lifts that meet on the 2nd floor. From there, the four pillars form a single pylon rising to a height of 324m. There are 3 floors at the Eiffel Tower, each floor has 2 levels. The first floor is large, large, there are 3 modern pavilions containing shops, a museum, a conference room, a restaurant, etc. The second floor is older, it is in the same state as at the time of construction. The third floor is much smaller than the others, there is an interior gallery and above a gallery in the open air. The shape of the Eiffel Tower has been studied with great precision. The engineers made precise calculations to be sure that it would not collapse. They studied the weight she would make to know if the soil would move or not. This description naturally leads to the analysis of techniques. To build such a tower it was necessary to use several techniques. 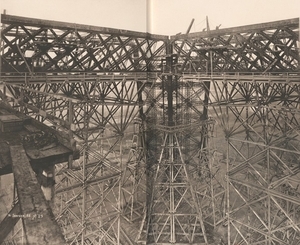 Gustave Eiffel had an entire service to find the methods of manufacturing the tower. It started with the foundations, which were hand-dug by workers. The earth served to smooth the soil, and when there was too much it was thrown out of Paris. Two pillars require another technique: We put a kind of bell upside down on the ground and the workers dug inside. Little by little the bell sank into the ground. When they arrived at the right level they poured concrete into the bell, to make the foundation. Above the foundations a large block of stone was built and the first beams were laid. As soon as it was too high to work with simple scaffolds, large wooden scaffolds were built on which the beams leaned. On the first floor, the workers had put sandboxes. By pouring the sand little by little the pillars could go down a little to get right. They had also put large cylinders in the pillars to guide them. 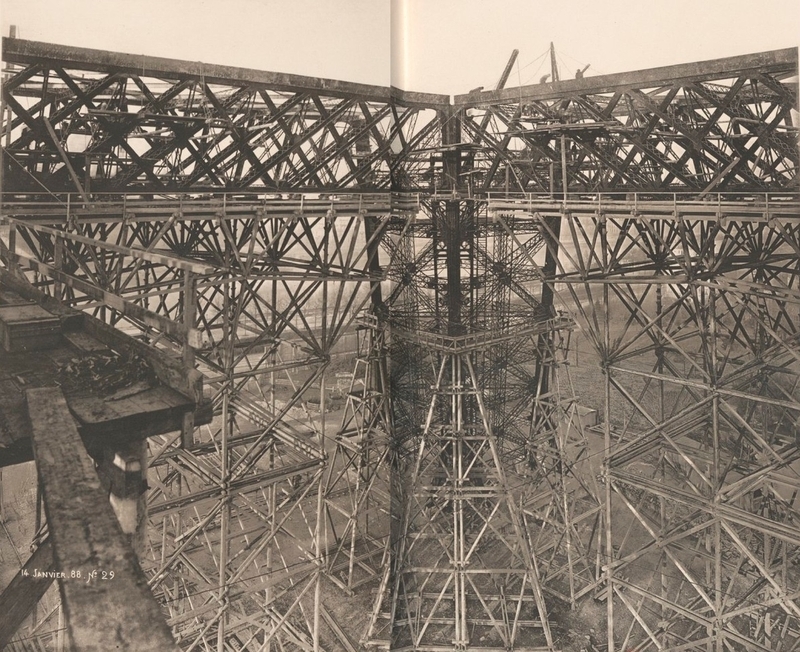 The beams were prepared at Gustave Eiffel's workshop, they were even mounted when they were small. On the construction site the workers installed and riveted them: It consists in putting a very hot rivet in the holes which gather two beams and to hammer hard to crush the heads. That way the beams were together and could not move. Once the alignment of the first floor was done the workers built the galleries of this floor, then the complete floor, and they mounted on the 1st floor of the scaffolding to continue the construction. it was necessary to use cranes to mount the beams so high. These cranes were put on the rails of the elevators (which were only installed later). That way the crane built the rails on which she would climb a little later. It is thanks to all these techniques that the Eiffel tower could be mounted. Then we must ask the question of the meaning of the Eiffel Tower. Apart from that, it would be a strange question to wonder what the Eiffel Tower meant. But in the sense of a duty on the history of art, it is necessary to indicate all that this tower signifies, its symbols. At primary level, it suffices to indicate that it is an important symbol of the city of Paris, and more generally of France. Moreover, when a foreign country wants to symbolize France, it will almost always use the silhouette of the Eiffel Tower. There is another important symbol, but it is an ancient symbol: The Eiffel Tower is above all the proof of the French technological know-how, since it was created on purpose to show what the French could do to their industries. Remember that it was built for the 1889 World Fair. The use of the Eiffel Tower has evolved over time. Built as we have just seen for the World Fair of 1889 where it was necessary to show the know-how of France, it was immediately used to earn money, since visitors were in a hurry, at least initially, to mount on it. 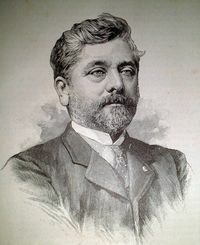 It is Gustave Eiffel who obtained the concession, ie the right to charge visitors for 20 years. After 20 years the tower had to be demolished. 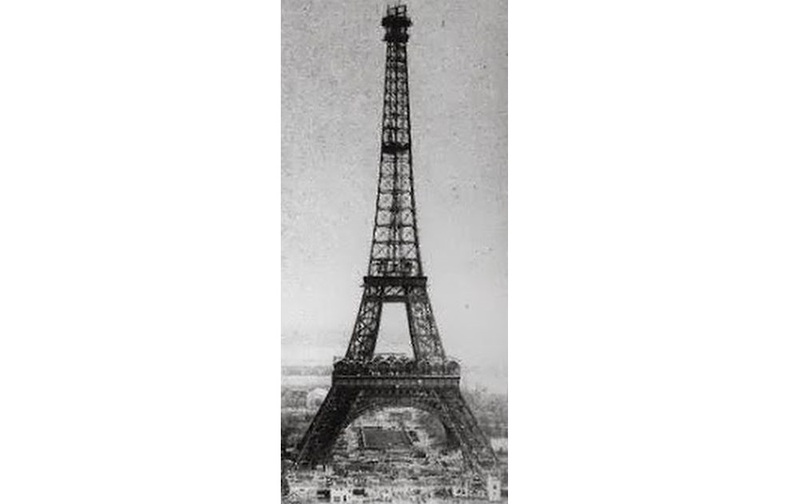 And to avoid that Eiffel has developed scientific experiments that have proved the usefulness of the tower. Suddenly, the tower had a new use, that of allowing scientific experiments. The soldiers then discovered that they could use it to communicate by radio, and the tower was saved definitively. 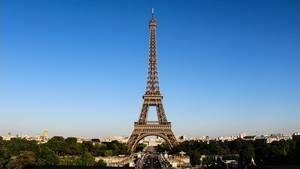 Subsequently and until today the Eiffel Tower serves as a place of visit for tourists. It beautifies Paris, that we can not imagine without it, while at the beginning, on the contrary, Eiffel received strong opposition for its construction. All that remains is to give a personal opinion of this monument. There, it is more difficult to propose since it depends on the way the student perceives it. Does it find it beautiful? Well proportioned? Great? This is the most personal part, so it's a part that has to be done entirely by the student. Well, there were some ways to do a history of art at the primary level, or more specifically at Cycle 2 because Cycle 1 is not really the right age to make history of art is rather an initiation that is offered to them. What must a duty in art history contain? We must find the answers to its 3 elements in the history of art. Moreover the works are analyzed starting from at least four criteria: forms, techniques, meanings, uses. It is through these four criteria that we will study the Eiffel Tower. This criterion consists of studying categories, types, genres, artistic styles, structure or composition. This is a fairly important criterion for the Eiffel Tower is a technological object whose shape as well as size has been of great importance. This part is just as important for the study of Taj Mahal in Art History, for example, whereas for the Statue of Liberty, it's going to be the techniques and the meanings. This second criterion allows the study of materials, materials, tools, supports, instruments, but also methods and techniques bodily, gestural, instrumental. Regarding the Eiffel Tower this part is really important, it is she who will contain the most information because the methods used, as well as techniques and materials, have been fully documented and can be studied in detail. Third criterion in the description of a work, it approaches the messages (transmitted, received, or interpreted), the senses (usual, general, particular, the variations of the senses in the time and the space), the code , sign (meaning / signified), reception, interpretation, decoding and decryption. It is a criterion that will highlight the symbolism of the Eiffel Tower, of course, and we will see that it is the least developed part. This last criterion leads to study the function, the use, the categories of recipients and users, the destination, the use, the transformation, the rejections, or the diversions of the work. If this part is very important, it does not need a particularly long development with regard to the Eiffel Tower, whose function is simple and the straight historical trajectory. Finally, it is important to give your feelings about the work, what it evokes for you. This part being purely subjective, it can not be developed here, and yet there is still a short text giving my own feeling on the monument. But like any description of a work of art, it is obligatory to begin with a short description of the context, the author and his work. Initially named "The 300m tower", the Eiffel Tower took the name of its author once completed, rather quickly. She was named in gratitude to her builder Gustave Eiffel, a public works contractor specializing in the construction of metal bridges and viaducts. Born December 15, 1832 in Dijon he will be raised by his grandmother. 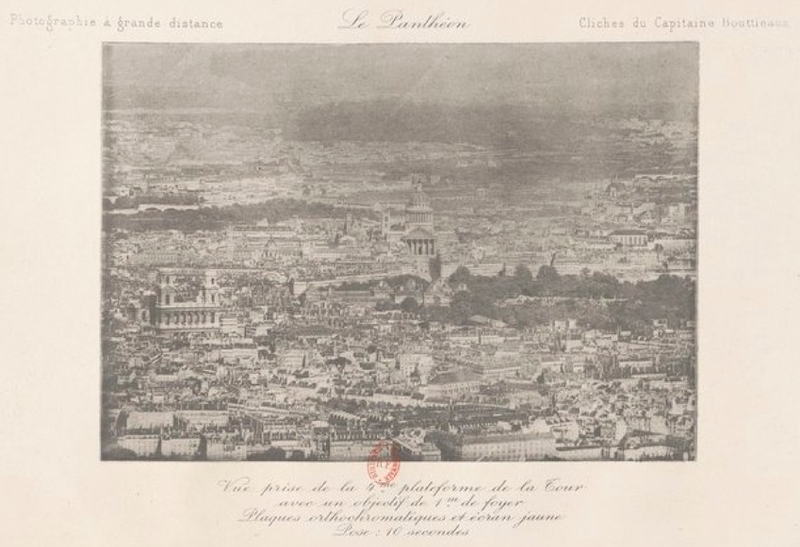 He will do his high school in this city, then integrate the Ecole Centrale de Paris from which he graduated in 1855. He then specializes in metallurgy, a new science, the metallurgical industry is booming (We are in the industrial revolution ). Working for a year for Charles Nepveu, a steam engine builder, he followed his career with a position of responsibility, in 1857, to the design office of Pauwels et Compagnie where he designed his first bridge, that of Bordeaux. He left his post in 1866 to become a consulting engineer, then set up his business in 1867 with which he would obtain wealth and recognition. Author of numerous bridges and viaducts throughout Europe, then throughout the world (Portugal, Romania, Algeria, Siam, etc. ), he will realize some unusual constructions: Budapest Station, internal structure of the state of Liberty, in New York, etc. From 1887 he devoted himself to the study of a metal tower of 1000 feet, which represents a challenge for all the architects of the world. This tower, which some people think is unachievable, will be born of the spirit of its head of study Maurice Koechlin. Emile Nouguier, his head of the methods department, is also working on this project. 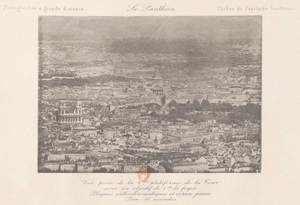 At the same time, Paris is hosting the 1889 World's Fair. Eiffel therefore proposes to build this tower as a gateway to the exhibition. A competition is launched for its edification, so this is the origin of the Eiffel Tower: The competition of the World Exhibition of 1889. The tower was built from 1888 to 1889. It was inaugurated on March 31, 1889. Expected to be demolished 20 years later, at the end of the exploitation concession given to Eiffel, it will be saved by the army that will be there. makes tests of conclusive radio teletransmissions. Meanwhile, Eiffel has multiplied the Scientific applications to prove its usefulness. That's why she always stands in the center of Paris. Because of its high emotional impact, the Parisian Eiffel Tower was never seriously ranked among the "technological titans" that marked the end of the 19th century. At that time, France was not yet one of the leading figures in the world and regarded such demonstrations of power with suspicion. Later, in 1941, in the momentum of its development, America was to take the lead of this gigantomania with the presidential sculptures of the Rushmore Mountains in South Dakota. As the name suggests the Eiffel Tower is part of the field of architecture. Its tower name can be seen as a usurpation, in fact it is more of a pylon than a tower. It is post-industrial style of the late nineteenth century, according to the will of these designers and in accordance with the time. It is not a neo-industrial style as we can find nowadays, that is to say a style imitating what existed at that time, but made of modern materials. More pragmatically the shape of the Eiffel Tower is dependent on the laws of physics. To build a 300m iron tower, it must meet the criteria of form that are imposed without any artistic consideration. Moreover, a few years later, a London competition was launched to build a tower taller than Paris, under the same conditions. The only viable project was an octagonal tower whose actual construction forced the architect to transform it into a pyramid with 4 pillars, exactly the same shape as his little sister. We can therefore conclude that the shape of the Eiffel Tower is imposed by its very nature of high-rise tower. The Eiffel Tower is a curved pyramid based on four independent pillars meeting at the 2nd floor to form a single pylon. It has 3 floors: A first while the pillars are not yet joined, a second at the joint of the pillars, and a third at the top. Sometimes it is called the 4th floor to designate the rooms containing the technical broadcasting facilities that are above the third floor, but their proximity makes it seem like a single floor. Note also the presence of an intermediate floor between the 2nd and 3rd, it was used for transhipment of passengers to the construction, when the lifts were not yet able to climb the 160m separating them in one go. But more than its shape, it's the decorations that give the style of the Eiffel Tower. Initially the decorations were very busy, at least that's how we perceive them today. We can talk about baroque style. In 1937, but especially in 1980 the new developments made the tower very modern, the floors had clean forms, rectilinear, angular. The first floor was redone again in 2011, it is now even more refined and modern, but of a rounded style, like the pavilions or the elevator stations. Light plays an important role in the shapes of the Eiffel Tower. By integrating itself within the structure itself, it does not just highlight its silhouette but represents one of the structural elements, an element that exists only in the evening, of course. The construction of the Eiffel Tower required great skills in several areas. It is therefore normal that this part is one of the longest. The tower is composed of interlocking beams on which the floors come to rest, which can be seen as plates cutting the axis of the tower. We call "crossbowmen" the main beams that structure the building, they start from the bases at a rate of 4 per pillars and join 2 to 2 at the second floor, to meet all at the top. But before asking the question of the techniques used for the rise of metal architecture, we must start with all that has been necessary to do before. The design of the plans did not require special techniques, it is plans quite classic, well that there were a lot of pages and technical drawings. It is to the realization of the foundations that really began the use of the particular techniques. foundations were done in two different ways. Those are the furthest from the Seine, they were made by hand, with shovels. The land was distributed on the site to level the level but the surplus, quite substantial, was evacuated by horse-drawn dumpers or more modern steam locomotives. The two northern foundations received water infiltration, they were too close to the Seine. The method used to avoid drowning was original, it had already been tested on other sites. It consisted of placing a metal bell of the size of the foundations, upside down, on the ground and to send air under pressure. Thus compressed the air prevented the water from infiltrating and the workmen could dig in the bell without being disturbed by the infiltrations. There was an airlock that allowed the workers to come in and out of the bell, mostly used to evacuate the land. As the digging progressed, the bell sank into the ground until it was at the proper depth. Workers and equipment were evacuated and concrete was poured. In the foundations of the concrete blocks were poured, it is large block on which support the pillars. It is on these massifs that was fixed the starting shoe for the crossbowmen. The connection between the foundations and the pillars was made using a hoof in which a counter-shoe was wedged. One could turn slightly and move relative to the other and between the two Gustave Eiffel had a hydraulic cylinder installed high power. So when the four pillars were built, the jacks could push them slightly until they were all aligned at the level of the first floor, something impossible to achieve the first time. The presence of these cylinders has fueled the legend that the Eiffel Tower is mounted on a cylinder, which is false since they were dismantled as soon as the first floor was finished. The assembly of the beams was done in the workshop, as often as it was possible. The idea was to minimize work on the site. The beams should not weigh more than 80 kg to be able to be raised to 2 men, without mechanical assistance. They were assembled according to the riveting technique which consists in hot crushing a rivet, a kind of big nail, in the holes of two beams to unite them. A team of riveters was composed of 4 people, one who positioned the rivet in the hole, one who held it in place while a third hit him on the other side, and a fourth in charge of heating them in a brazier. As soon as the pillars began to rise, it was necessary to use wooden scaffolds, one per pillar, placed under each pillar. After a certain height the pillar was too cantilever to hold alone, it was likely to tip over. Scaffolding was therefore not only a means of mounting materials and assembling, but it also served to maintain the balance of each pillar. At the first floor level, sandboxes were installed at the top of the scaffolding. 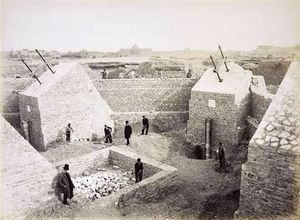 A sand box is a technique for finely adjusting the height of a pillar, in the case of the Eiffel Tower. The latter leaned on caissons filled with sand. By partially emptying the sand it was possible to adjust the height of the pillar very slowly. When the four pillars were at the right height, the heavy connecting beams of the first floor were mounted. From there, there was no risk of collapse of the structure. To erect the beams Emile Nouguier, head of the method study bureau, had planned the use of cranes. These cranes were mounted on the rails that were to serve, at the end of construction, lifts, so that they mounted in the structure at the same time. More original: The cranes were also used to mount the rails of future lifts, so they created their own future paths! The climbing technique of a crane was quite complex. It had to be stopped by cleats, made to climb with a large hauling screw, followed by two safety cylinders, then climb the platform and lock it all. But it had to be done several times, the run of the cylinders was only 50cm. From the first floor the techniques used were the same: Cranes and beam assembly by scaffolding. On the second platform the scaffoldings were at the end of the race, they were dismantled and abandoned, only the cranes were used, but they had to be modified because there are no more rails from the 2nd because the tower is transformed in pylon, from the 2nd floor. The two elevator cages are distributed on both sides of a central pylon around which were assembled two new cranes which mounted according to a protocol a little different but quite similar. The Eiffel Tower was not built for an artistic purpose, so it is clear that this part will be the least developed of all. The analysis of meanings must be concerned with the messages that the monument passes to its recipients. In fact there are not enough, but they do exist and are in the origin of the Eiffel Tower. This tower was built for one purpose: To show the know-how of France in the industrial world. This is the original message. The tower was originally known as the "1000-foot tower" and then "300-meter tower" before it naturally took the name of its author. The idea was therefore just to achieve a feat, that of building a gigantic tower with modern materials, the puddled iron. It served as an entrance gate to the 1889 World's Fair, because of the launch of the competition for its construction, and its goal was reached since a little around the world there was talk about it and its creator. Later the message changed. The Eiffel Tower has quickly become what it is today: The symbol of Paris, and beyond that of France as a whole. It is indeed the Eiffel Tower that we represent when we want to symbolize France in a single logo, a single image, a single description in a book. It alone marks the imagination of the spectator / reader who associates an entire people to this metal structure. The reach of the tower depends on where you are. In France, the Eiffel Tower is a representation of the capital. In Europe and even elsewhere in the world, it represents France, but sometimes it is the Eiffel Tower that is chosen to represent Europe, although it is more rare. We can say that this monument symbolizes French genius, Paris and France, but that's about all, the tower has no particular symbolic burden. Note the will of the developers of the first floor, which recently placed everywhere "Places to kiss" (places to kiss) bringing on the tower itself the image of romance that the capital of the country. During its history, the Eiffel Tower has had many uses. The first is the main, it is related to its origin, its role was to highlight the French know-how in the technological field of the late nineteenth century. But since its construction, the use of the monument as a tourist site was one of its main functions. It was even designed for that since the original 20-year lease was supposed to be used to supplement the financing of the book. But these are not the only uses that have been made of the building. 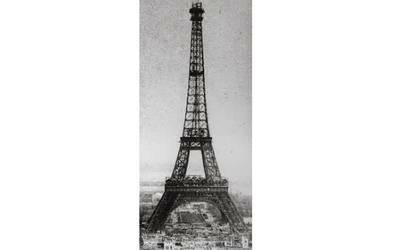 At the end of the 19th century it was the first time that we had a 300m tower, and that in full Paris. It was therefore tempting to make a scientific use of it, which was done as soon as it was built. There was a meteorological laboratory, one of the first, and for the first time we could study the difference in weather between the ground and the altitude of 300m. (see the Weather Observations 1889 and 1890 There were applications in the fields of physics, with the study of the solar spectrum, Atmospheric Absorption of Radiation, the Pressure and the air resistance, equipment, which consisted in installing a high-pressure manometer at the top of the tower, the military domain with the military broadcasting, the optical telegraphy, but also in the aerial navigation and optics with the development of the telephotography. But it is the aerodynamics that has the most advanced with the Eiffel Tower. Gustave Eiffel had set up equipment for studying the air resistance of different geometrical shapes and it is thanks to these results that the the first wings of the plane were created, launching aeronautics. All these experiences took place during the first years of the tower, at a time when its creator wanted to prove its usefulness and thus save it from destruction (which was done). But later she had other uses, such as, for example, serve as advertising medium to a car brand, which wrote the famous letters CITROEN on one side of the tower. Much more recently it served to pay tribute to the victims of the various attacks that took place in Paris, then in Brussels, which was done by adopting, for a night, the colors of the flag of the country touched, even extinguishing. The Eiffel Tower is also a support for the sportsmen, and that also of all time. We think of the race "The vertical of the Eiffel Tower", which consists of climbing as fast as possible to the 2nd floor of the tower. We remember a skating champion, Taïg Kris, who jumped from the first floor in rollerblading on a reception ramp located on the ground, it was in 2009. A few years before, in 1989, it is a tightrope walker, Philippe Petit , which joins the first floor to the roof of the Trocadero while walking on a cable. The Eiffel Tower is therefore used for a lot of events, but it's rarely artistic events. Hard to give guidelines for the study of the Eiffel Tower when it comes to give his personal feeling about this monument, simply because if it is personal, the feeling can not be reproduced as it is for others. However, I can give my own feelings about it, it can serve as a basis for work. My personal feeling is that there are several Eiffel towers, it depends on how you approach it. If you look at it from a distance, in aerial view, or with a general view of Paris, it is especially the impression of greatness that is put forward. Its size is impressive, and associated with the delicacy of its lace, I feel that it is incredibly light. Its beauty is therefore rather aerial. On the other hand, when I look closely, I am rather impressed by the solidity of the building. The metal links, by interposed rivets, reinforce the impression of solidity that one can vaguely have when one sees it closely. The Eiffel Tower then sends back a feeling of strength, it impresses the one who looks at it. Finally when I'm on the tower, in the floors, it has the mechanical beauty of perfectly oiled gear. Beauty is technological, in the industrial sense of the term. The Eiffel Tower is indeed a work of art, but the way I perceive it depends a lot on where I stand.